What a manic, beautiful, stressful, inspiring, thoughtful and happy couple of days I’ve had. LocalGovCamp and Fringe 2014 is over (or at least in the physical event sense, the online aftershocks continue) and I *think* it’s been a success – a relief as I was this year’s main organiser on behalf of LocalGov Digital. 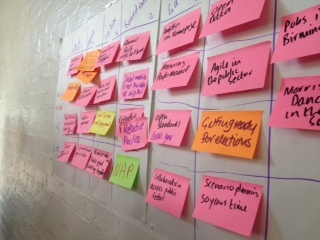 I’ll try and blog in more detail about the few sessions I participated in over the course of this week but I’m just getting a few early notes down about the events that happened, on being organiser and what the camp meant for LocalGov Digital. Let’s get the thank yous done first. Phil Rumens did an awesome job of pulling together this event by partnering with Nesta – a massive thank you to him, Haidee Bell and Paul Mackay for their work preparing the day and running it. I loved that the group’s got straight into the challenges with access to resources from Nesta, NHS Choices, Ordnance Survey and more. And it wasn’t just tech stuff happening, there was lots of customer journey planning and UX happening in the room. In just a few hours they bought this together into prototypes for the three challenges which they presented in front of the delegates from the Leaders’ Summit. There’s already plans for follow up events and how to keep the momentum going so I think there’s a promising look to practical collaborative tools coming out of this for the sector. Also happening on the Friday was a Leaders’ Summit and the thanks here go to FutureGov, particularly Jon Foster, and Sarah Jennings at CapacityGrid. They pulled together a great line up of speakers to delivery 5 minute lightning talks and then got delegates to go hands on with service design and customer journey planning. There was a great energy in the room and it was great that so many of the delegates came over to the hack event and stayed on for day two and the unconference. There will be videos of the talks uploaded soon (massive thanks to Julia Higginbottom and Rebel Uncut for the filming) for those that couldn’t make it. As far as we know this is the first time that doers (Makers) and decision makers (Leaders) have been bought together in this kind of event and hopefully it fired them all up to the possibilities and practicalities of what digital can deliver. So, onto the big one, the unconference we call LocalGovCamp. There’s been a lot of reflection done over the last few days about the life of camp – from the first one in 2009 (right across the road from this year’s venue) to the fallow year in 2013. This was the fifth incarnation of LocalGovCamp and the biggest event I’ve organised. I think I put more pressure on myself because LocalGovCamp has been so important to me personally and professionally, I *so* hoped I could create an open space for others to experience that too. As it was our laid back (some may say shambolic) style on the day seemed to set the tone. We booked the space, ordered the coffee and food, gave people an idea of how the day worked and then got out of the way. And they all went for it – they suggested sessions and conversations just started happening. There seemed to be a really great energy around the venue and there’s a lot of positive tweeting happening now. I managed to get into some sessions – the first one on how we find all the good work and examples that are already out there, then I co-pitched one with Catherine Howe on comms not being the only flavour of digital and her emerging theory of the seven tribes of digital, and then an almost-structured reflective practice before trying to kick off work on a comparison framework for common CMS. I’ll blog thoughts on those separately. Sarah Jennings has blogged her reflections on her first unconference and how this was the point that LocalGov Digital – a passionate and determined group of practitioners – reached critical mass and became a significant movement. During the lunch break at LocalGovCamp we held an open steering meeting and as the core group sat in a circle on the floor of the main room and just began discussing the issues we’re facing (capacity, imitation, too modest with our level of influence), priorities for the next year and our structure. More and more people wondered over and sat round us, and it felt amazing. The core group has supported each other through getting established and beginning work on the streams but this was a physical show of the wider support for the group, that here at LocalGovCamp there were a whole load of people who wanted to push the movement forward and be a part of it. That feels possible. When I first started getting involved in the group and explained the concept to a long-time local govver they pragmatically told me groups like this happened all the time and they never changed anything before their energy burnt out. I thought that was wrong then, because I believed so strongly in the other people involved and the values which kicked us into life but today I *know* it was wrong. This isn’t an appointed committe, or a tick box exercise, this is people who *care*, people who are passionate and people with the tools at their disposal to convert that into action. That isn’t a fast burning flame, that is the heat under a hundred fires or more. That is a movement, and one I now think can’t be stopped only steered by those within it. A whole load of stuff – there are people and tweeting about their own to do lists from the sessions they attended or the conversations they found. For LocalGov Digital there will be more events, there will even be a LocalGovCamp 2015. Yes, yes, I know. I said I didn’t want to do it again, that once had been quite enough thank you. But it actually isn’t. That’s just the organiser rollercoaster made more extreme by trying to do this on top of the day job, the journalism and the family. It’s tiredness and the worry of letting people down by not having time to do things the same way someone full time on it might. But it’s not just me. I know that, I always knew it. When Carl announced at the end of the day that our aspiration was for Eden Project as the setting for LocalGovCamp 2015 I wasn’t paniced I was excited. I actually can’t wait to be a part of it again. Thanks to everyone that came to Camp and was lovely to me on the day and online. Sorry I didn’t get to talk to y’all – just another reason we must do it again! Finally, a big thanks to Carl Haggerty, Phil Rumens, Sarah Jennings, Nick Hill, Dave Briggs and Jon Foster for keeping me grounded when I whined in the run up and for making the event a massive success and to all the sponsors (CapacityGrid, FutureGov, PSCSF, Nesta, Jadu, Goss, GovDelivery, Public-i, dxw, Socrata, The Satori Lab, Resiflex and Comms2Point0) who made the event possible. If you want to get involved with organising LocalGovCamp 2015 then tweet @localgovcamp with ‘I’m in’. If you want to get more involved with LocalGov Digital then tweet @localgovdigital with ‘I’m in’. If you’re blogging about local government then make sure you’re connected to LocalGov Digital Voice so other people can find you more easily. And, let’s chat on Twitter. Having been full on with local gov stuff for the last few months I’m hoping to give some love to music over the summer and spend more time with Louder Than War. Posted in Events, GovCamp, local government, LocalGov Digtial, localgovcamp.Tagged localgov digital, localgovcamp.